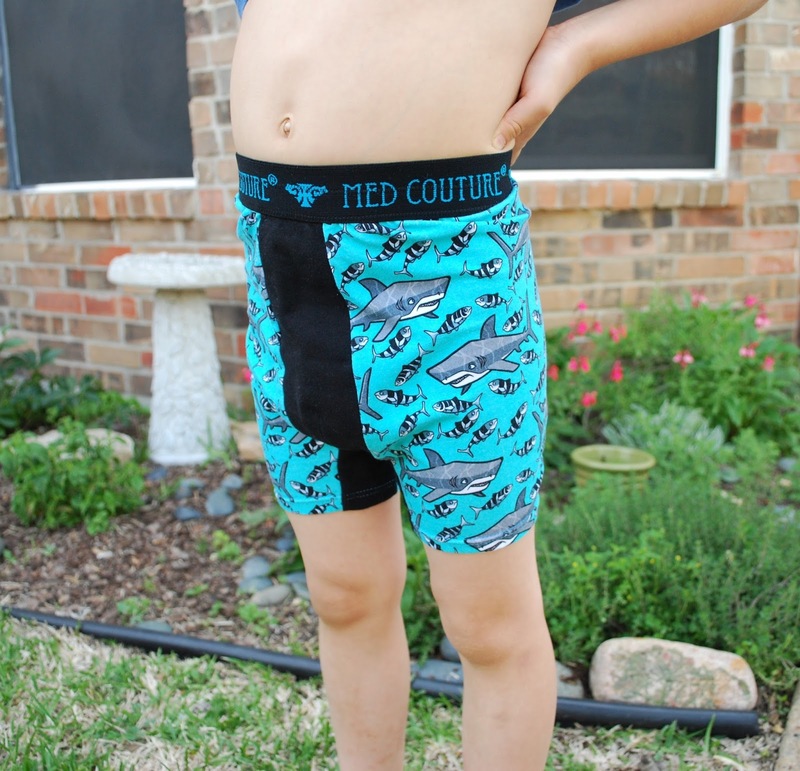 My middle child has been growing like a weed lately and needed some new boxers. So, today, I whipped up a few pairs of new boxer briefs just for him. I always have a ton of scraps from other projects so I would much rather sew undies than buy them. I gave him a pile of scrap fabric and let him pick his favorite. He chose a solid grey (his favorite color), dinos, and sharks! 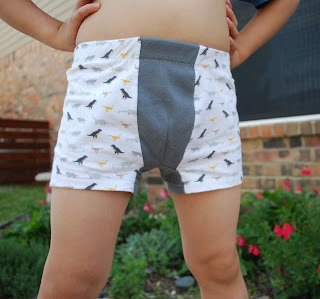 Making little boy briefs is a great scrap buster! 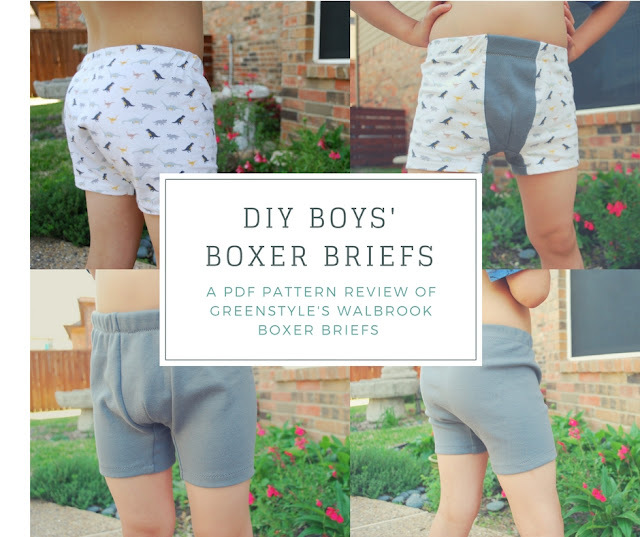 I used the Greenstyle Creations Walbrook Boxer Briefs pattern. This pattern comes in sizes 2T to 14 years old. A Men's version is also available for those outside of this size range. 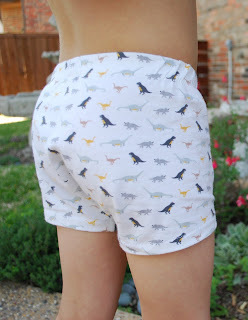 The pattern is only $5, and they are super quick to sew up! The pattern comes with the option of a high rise or a regular rise. The waist elastic can be enclosed or exposed. The fly can be functioning or non-functioning. My favorite part is the gusset in the legs. It reminded me of the Super G Tights pattern that Greenstyle makes for women that are so comfortable. I made a size 5/6, which is where his measurements put him. He is currently 5 and will turn 6 in three months. The size was spot on. I did not need to make any alterations to the pattern to fit him. The first pair was made with the regular rise and the shorter length. I used enclose elastic. The print for this pair is a cotton lycra knit by Riley Blake. The coordinating grey on the fly and gusset is interlock. I think this is my favorite rise and cut length of all. I used 1 inch enclosed elastic. Do you see that grey gusset sticking out? This makes these underwear super comfortable. It puts seams right where they should be and gives so much more movement. I love that this pattern works just as well for interlock as it does for cotton lycra. On this next pair, I used a Robert Kaufman interlock in steel grey. This boy loves plain grey. It is so hard for me to buy solids, but it sure makes him smile. 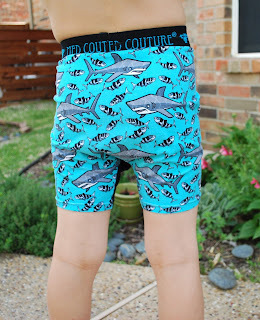 Finally, I made a pair with a cotton lycra shark fabric that came from Made Whimsy. On this pair, I used exposed elastic that I found in the Dallas Fabric District at Super Textiles. This particular elastic is super plush and soft against the skin. I am not sure what "Med Couture" means, but I am sure it was some overstock Steve (the owner) found. If you are ever in Dallas and love fabric, buttons, or random finds, go visit Steve! Here is a side-by-side comparison of all three pairs. You can purchase your copy of the boy's Walbrook Boxer Brief pattern here. You can get a copy of the men's version of the pattern here.